Eros Grezda has promised Rangers supporters he will only get better after a frustrating full debut for Steven Gerrard's side. The 23-year-old winger arrived from Croatian side Osijek with an ankle injury, forcing him to wait until Saturday's clash with St Mirren to break into the starting XI. Grezda looked a little rusty before being replaced by Daniel Candeias on 55 minutes but the Albanian has vowed he will get stronger and slicker with more action. "It was okay but I'm still not there because it was my first game in the starting XI," he said after being asked to assess his first start. Highlights of the Scottish Premiership match between St Mirren and Rangers. "I'm quite happy but it's going to get better and better. "Was I frustrated at being left on the bench for so long? No because I was concentrated only on training and putting in hard work. "I was waiting for my chance. Now I look fitter than I was. Everybody knows I didn't play for a long time because of injury. Now I feel better. I really feel I'm coming back. I feel I still need more games but I'm almost there. 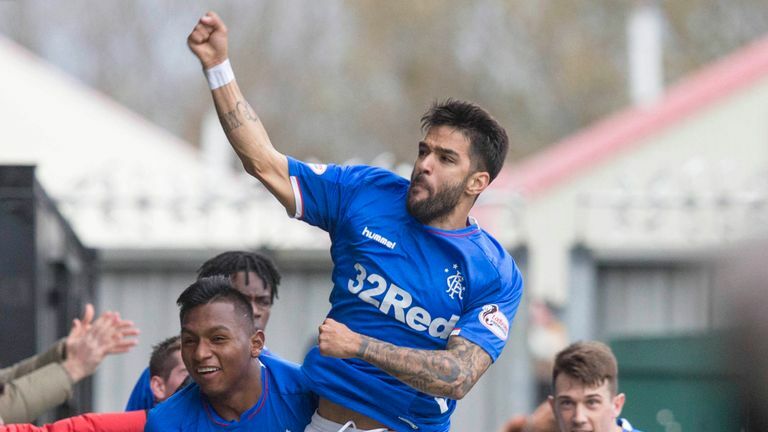 Rangers boss Steven Gerrard was satisfied with Grezda's display in Saturday's 2-0 win at St Mirren and backed his summer recruit to improve. "I thought he grew into the game," Gerrard said. "His best moments were probably the last five minutes he had. "He hit the post and had he scored it would have helped him a lot. He's had a bad injury and a tough time getting back. He will get better."